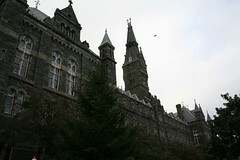 Georgetown first-year student Alex Thiele, recently arrived from La Jolla, California’s Bishop’s High School was arrested this morning at 12:30am for possession of an unlicensed firearm, according to Georgetown’s Vox Populi blog, who have a copy of the original police report. It seems that the firearm was taken off a US Park Police officer during the Midnight Madness event at McDonough Gymnasium, and was discharged, with a toilet in the Men’s bathroom destroyed as a result. We’ve contacted the Park Police, and hope to have comment as to whether or not Officer Clanton was on or off duty, and how her service weapon came to be in the hands of Mr. Thiele. Well, I can honestly say that if I stole a police officer’s gun, the first thing I would do would be shoot a toilet. It’s just too tempting. I shot the sh*tter, but I did not touch the dirty seat.